Starfish at Palm Cay is a near beach townhouse in a gated and child-friendly community located in New Providence, The Bahamas. The community offers tennis courts, children's playground, swimming pools, beaches and marina. The luxurious villa has 4 beautiful bedrooms with 3.5 bathrooms and will sleep 8. The comfortable villa provides the perfect destination for the vacation of a lifetime! Just 50 steps to the sand. The villa is 2,200 square foot on 3 floors of luxury offering several amenities that will make your stay more comfortable and pleasurable, including free wi-fi internet, and just steps to a beautiful beach with snorkeling. The gorgeous brand new villa features travertine tile floors downstairs and hand laid wood floors on the 2 upper floors. The villa is air conditioned throughout with central ducted air conditioning. The master bedroom features a queen-size bed, lovely décor and an en-suite bathroom. There is a second bedroom on the same level and is furnished with 2 twin beds. It has its own en-suite bathroom with a shower. The third bedroom on the top floor is furnished with a queen-sized bed and also has an en-suite bathroom with a shower. This bedroom has a beautiful balcony. The fourth bedroom is a studio style bedroom located on the top floor and has a double bed, sharing the en-suite bathroom with bedroom 3. The living room at the villa is spacious and features very comfortable sofas, lovely art work, beautiful fabrics and tiled flooring. The entertainment system includes a large flat screen television offering a wide range of cable tv channels, as well as internet, music. The home is also stocked with board games and books. The swimming pool at Starfish Isles, Palm Cay is spacious and is surrounded by an expansive deck. Comfortable lounges are placed on the deck for relaxing after a swim or for simply soaking in the sun. The table and chairs on the deck can be a good place for evening drinks or even for a candle lit intimate dinner. The kitchen at the villa villa is fully-equipped with a refrigerator and all essential appliances, and has a fresh and bright look. There is also a laundry room with washer and dryer. You might even like to engage your own private chef to make your vacation just perfect. Guests at Starfish can simply take a short stroll to the club house and enjoy meals or a drink. The club house offers jazz night of Fridays and barbeque day on Sunday. Be sure to check with the club for further details or any additional activities. The marina in the complex offers several water-based activities, such as charter tours, boat rentals, snorkeling and much more. Palm Cay is located 30 minute drive from Nassau's international airport and within 10 minutes from downtown Nassau and Paradise Island. Arrangements for airport pick up to and from the airport can also be made for guests at the time of the booking. Renting a private villa in The Bahamas sounds expensive, but it isn't and you will be pleasantly surprised by our reasonable rates and quality accommodations. We have multiple villa options available so if your group is larger than a single unit, let us know and we can provide a group arrangement for you. 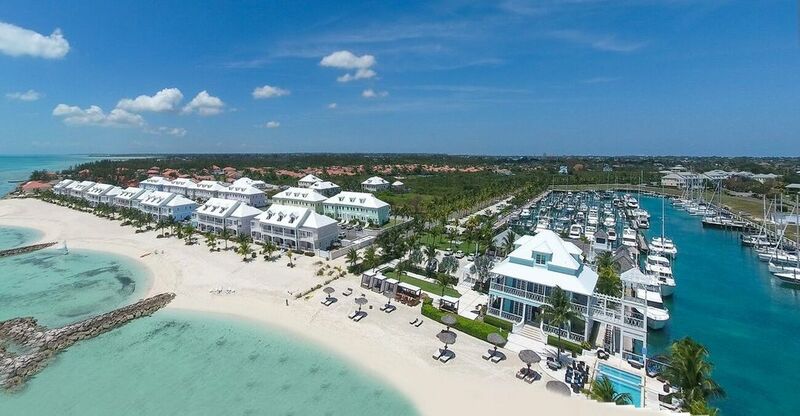 There is an extra fee charged by Palm Cay for access to the Member's Beach and Members Bar. In the case of this unit the owner offers a 50% subsidy of the Palm Cay Club Fee for your stay! Access to the member's beach and pool entitles your group to use the Palm Cay Club member's beach and the member's pool. You can of course use the Starfish Isle beach, restaurant, tennis court, children playground and Starfish pool at any time without joining. Remember too that there is an additional fee paid to Palm Cay for use of gym, water equipment such as kayaks and paddle boards. and tennis equipment. The fee is optional, If you decide to opt into the programme your share of the fee can be paid to Palm Cay on your arrival. With over 10 years villa sales and property management in the Caribbean we are your professional property manager to make your stay here at Palm Cay perfect. We weren’t able to make the trip but thank you for the wonderful information in preparation. We are going to try and re-book for October. Very easy with small kids - quick access to the beach and well appointed property. The club food could be improved, but overall this is a great place and Mike is quick to respond and very helpful. We had an amazing family holiday. The house itself is a fantastic spot for a family vacation. It clean, spacious and functional. The beach is literally 50 paces away and there also a pool that is about the same distance as well. My major criticism is in regards to the restaurant and bar. The restaurant had no fish available despite it making up a major portion of the menu. It's a staple to have fresh seafood when staying by the ocean. This was a major disappointment. Also the drinks were ridiculously over priced to the point where it wasn't even worth sitting at the bar.